The biggest problem is that the actor playing Han Solo is not Harrison Ford. But who is, huh? Cool movie with many little details and easter eggs for fans and interesting characters. Maybe it has too many plot twists for children to understand what´s going on. Older kids and adults will appreciate it more. Wow! Yet another dismal series of explosions, mass killings and 'special effects'. Take away the computer generated effects and you have - not much. Tried to keep track of the number of people and 'things' killed but got bored doing so. Shocked that some parents brought their 3 and 4 year old children to see this mindlessness. Visually great. But story-wise ... how they managed to cram all of Han's achievements & highlights in his life before "A New Hope" in about a week of movie time is preposterous. What else is there for him to show in a movie to make up for the next decade or so he lived? Nothing's left (unless you want to see some smuggling for the Hutt cartel - that's about it). Youth: Well that went down the drain fast - literally. Couldn't even bother having a younger version for a bit. Imperial Academy days: would have been so nice to see. Kessel: Spice mines? What spice mines? No mention here. I hope the make another Solo movie. If you're a fan of Star Wars movies then you will probably like this one. If your not a fan and have not seen the first three with Harrison Ford playing Han Solo then don't go. I liked the movie, but the actor playing Han Solo didn't have the charisma of Harrison Ford. Good to know the backstory of Han Solo after seeing the first three star Wars. All in all, I liked the movie, but I'm a fan. If you never saw a Star Wars movie, this might stand alone. I am glad I paid for Deadpool and walked into Soylo. If this movie had been done with Harrison Ford at a young age it would have been great. The problem with it is that casting does not live up to Harrison Ford's Han Solo. I loved the first Star Wars movie from the time I saw it when it originally was in the theater and even love the newer movies. This one just does not live up to the tradition in the only thing that keeps it from being the worst Star Wars movie is Jar Jar Binks. Fun movie! Excellent addition to the franchise and way better than TLJ. With all the bad publicity and my lack of enjoyment of the last 3 films, I wasn't going to bother to see Solo. I was done with the franchise. However, a friend convinced me to go and to my complete surprise I really liked it. I found it entertaining and refreshing and different than the others as it wasn't the same formula. I hope they do make a sequel but it doesn't sound like the movie did well enough for one which is a real shame. I was concern going to watch this movie because SW is not producing any longer good movies but this one was the exception. I did not feel I was watching Star Wars. The acting and plot was excellent. I loved this movie on IMAX format. Finally, Han Solo story. Mostly in dark / grayish colors, continuous music background (turning after a while in a continuous noise), characters speaking in low voice, poor acting ... not much different from cheap TV sci-fi series. I really like the Alden Ehrenreich in this movie, he is a good actor. If you haven’t seen the other Star Wars movies you will like this one. You might like this one if you never saw the originals, but unfortunately I have, and this doesn't measure up. WHAT were they thinking? Thought it had a lot of excitement going on. Liked the cast. It was easy to relate the character to the other Star Wars movies. Best unique movie. No a regular movie as the previous ones. Full action pack adventure. I did not know that Han Solo could speak Wookiee. That was so funny. We are glad that we waited to watch this movie this week because we don’t like to go to the premiers. We checked this site and some YouTube videos before going to watch this movie. We found the movie enjoyabled and fun. I like this movie because was not a typical Star Wars movie. A new and unique story. I don’t work for Disney. I wish I could. Lol This movie is showing all over the states so many people post in here from different places. My money was well spend watching this movie. This movie seemed all over the place. At times I thought it was very serious and then out of nowhere I would think is this a spoof movie. It seems like Disney just decided that they didn’t need to put any money into a good script because it is Star Wars and at worst it will still make a ton of money. I can honestly say that I think the 5 star ratings are done by either Disney or someone at the theater to try to get you to spend your money because I haven’t talked to a single person that would rate this anything over 3 stars. 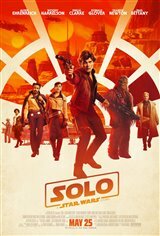 Solo: A Star Wars story was an awesome movie. I loved it! Best so far. We needed a sequel. Han Solo was the best pilot of the galaxy. Lol This movie was a total action pack story. Finally they did a good job with this movie. The previous movies were not so great. Just another movie where they couldn't afford to pay the electric bill. If they are going to spend tons of money on costumes and makeup, turn on the lights so we can see. Worst Ron Howard directed movie ever. This movie was super fantastic. Very clever and packed full of action and interesting characters! Thoroughly enjoyed! Nice storyline to understand Solo’s history. Good characters, girlfriend was amazing. Recommend! I will watching this movie again. I think it was good and fun. Some childish crap, action and cg is great.